This is a book that talks about the craft of writing from a master craftsman who has written more than 50 bestselling, novels. He has also written many novellas, short stories, essays, and articles. 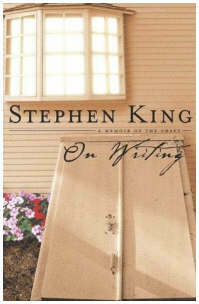 In this book King describes his life, his writing and how to improve both. In King’s case, the writing career and the personal life are tightly intertwined, which makes reading more interesting as the book is replete with personal details and anecdotes as it is with knowledge and wisdom that one gains through extensive practice of one’s craft. King’s passion for life and writing shines through each and every page of the book. The book is divided into 5 sections—C.V., What Writing Is, Toolbox, On Writing, and On Living: A Postscript. It also has two appendices—Door Shut, Door Open (an example on editing and rewriting) and A Booklist (a list of books recommended by the author). In the second section—What Writing Is—King tells you that it is telepathy. He then goes on to explain his theory. In the section named ‘Toolbox,’ King uses the analogy of a toolbox and its contents to explain the skills needed for a writer. The cardinal principal is that the more one practices the better his writing becomes. To quote the author, “If you don’t have the time to read, you don’t have the time or the tools to write.” King’s toolbox for writers contains tools like vocabulary, grammar, hard work, and so on. He gives some general rules about his likes and dislikes, what is good and what is not (avoid passive voice, eliminate the use of adverbs, etc. ), but points the readers to Elements of Style by Strunk & White for more on grammar and usage. The fourth section titled ‘On Writing’ is the heart of the book. This is where King explains the intricacies of writing—writing fiction. Readers get advise on how to create an environment that promotes writing, how to get ideas for writing, how to begin the story, how to develop the characters, how much details is required, why it’s important to tell the truth, how to prevent writer’s block, how to edit and rewrite, how to find a select group of reviewers, how to handle criticism and so on. It also has a section on literary agents and how to find them. This section, like all sections of the book, is full of anecdotes, real world examples, and experiences. The final section (On Living: A Postscript) is about his accident that nearly killed him in 1999. He was hit by a van during his morning walk. He had chipped his spine in several places, had multiple fractures on both legs and hip and almost bled to death. He survived and slowly got back to his life and completed the book—On Writing—which he had just started before the accident. This is one of the best books on writing you will ever find. It teaches you a lot of things not only about writing but also about life. King never assumes the role of a teacher; he just tells his story and shares his impressions and his opinions. But in that process, he imparts a lot of knowledge and wisdom to the reader. This book must be on the desktop of every writer—novice and accomplished, beginner and expert. When you are stuck, when you need inspiration or motivation, read this book and you will find what you need. I recommend this book to all writers. This book is not very useful for nonfiction writers. I tried to read it, but a lot of things that is not related to writing.